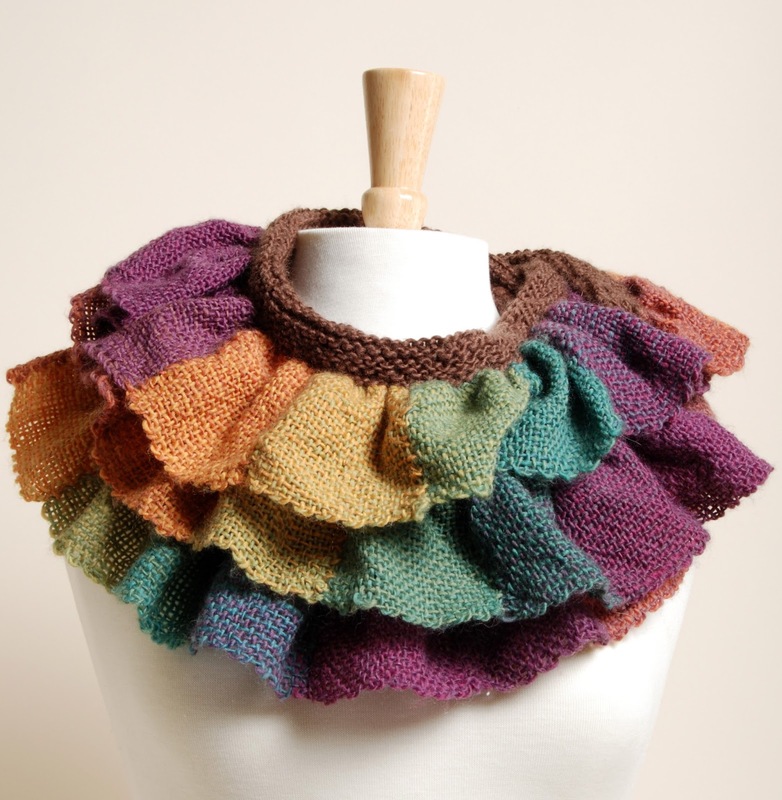 Constance Hall has given us another sweet project: A ruffled scarf using many (60!) Zoom Loom squares and basic knitting skills.This project could be used as a great stash-buster and is perfect for fall-weather layering. Yarn: Crystal Palace Mini Mochi color 316 Equinox for the squares, 3 skeins; Plus Solid color 1105 Walnut for the knitted band, 2-3 skeins. Notions: 47″ circular knitting needle US size 7; yarn needle; small crochet hook (optional). Zoom Loom squares and knitting combine to give this scarf a charm all its own! Using the slow color shifting yarn gives you a finished project that looks complicated but is really easy to make. The squares are woven and sewn together end to end. Stitches are picked up along the edge and a knitted band finishes the look. 60 squares make a scarf 110 inches long, requiring 2-1/2 skeins of the Mini Mochi. 2 skeins can be made into 48 squares making a scarf about 80 inches, a more standard length. The number of decreases in the knitted band determines how much ruffling the scarf has and also affects the finished length. Weave 60 squares or amount chosen for desired length. When wrapping the yarn around the loom to measure for the length needed for the weaving, make sure to wrap the yarn around a full 5 times. Do not weave in the long tail as it will be used to sew each square to the next. Before you take the square off the loom, weave the short tail back into the square. Keep the squares in order as you weave them. When you are finished weaving, you will sew them together in the order they were woven so that the color slowly shifts from square to square. Make a new stack of squares for each skein. Before you begin sewing the squares together, look at how the color shifts change from the end of one skein to the beginning of the next. You may want to remove or rearrange squares to maintain a pleasing color progression. Using a yarn needle and the long tail, sew each square to the next in the order you wove them. Pull the loops of the squares together firmly but don’t pucker the seam. When the seam is sewn, secure the yarn to the last loop in a small knot and work the tail back in the seam for a few stitches. Make sure you keep all the seams on the same side – this will be the wrong side of your scarf. You may not need all the squares for your scarf. You now have a long row of squares sewn together. With the right side up, pick up stitches starting at bottom right corner, as shown in the diagram below. Using the 47” circular knitting needle, pick up the first stitch in the bottom right corner, then pick up a stitch in the small area where the pairs of loops overlap. Continue up the side of the square, picking up stitches where the loops overlap. At the corner, pick up a stitch, then continue across the long edge, picking up stitches where the loops overlap, and at the seams, approximately 9 stitches per square. Space the stitches so there are no large gaps. At the end of the long side, pick up a stitch in the corner then continue picking up stitches down the left side of the rectangle. Turn your work and you are ready to knit. Row 2: Knit 3, knit two together (k2tog) Repeat across. Alternate rows of knitting and rows with decreases (k2tog) until the band is as wide as you like. When the yarn gets low, bind off. Weave in yarn tails. Once the band is knitted it can be left as is or folded over and stitched down. If folding over, you will need to knit the band twice as wide as you want the finished band to look. Using the yarn needle and the solid brown yarn, sew the edge of the knitted band to the join line where the stitches were picked up. This makes a nice rolled edge along the top of the scarf. This scarf really needs no blocking. The knitted band can be blocked, if desired. The scarf pictured was not blocked. Yarns courtesy Crystal Palace Yarns.